One day of preparation for Standard, and no preparation beforehand for Limited would usually be enough to deny any Pro Tour competitor the chance at a Day Two finish, especially given the high level of competition and time put into beating the format by many attendees here this weekend. However, Kamiel Cornelissen is not one of those players who can be beaten by lack of time to prepare for the event. The Hall of Famer from the Netherlands came to Pro Tour Theros with little preparation, and yet was storming through the tournament with an impressive finish. His Standard deck of choice? A Mono-Red Devotion deck Frank Karsten built for him at the Theros Prerelease. His first game of Theros Limited? 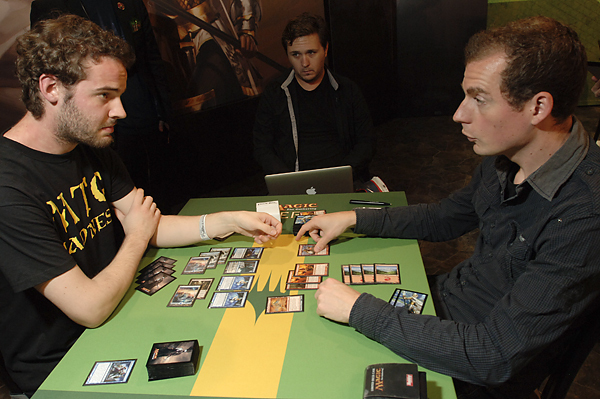 Friday, when the Pro Tour competitors sat down for Round 1 of the event. Cornelissen has, without question, shown why he is in the Hall of Fame. His opponent, however, has been slowly making a name for himself. 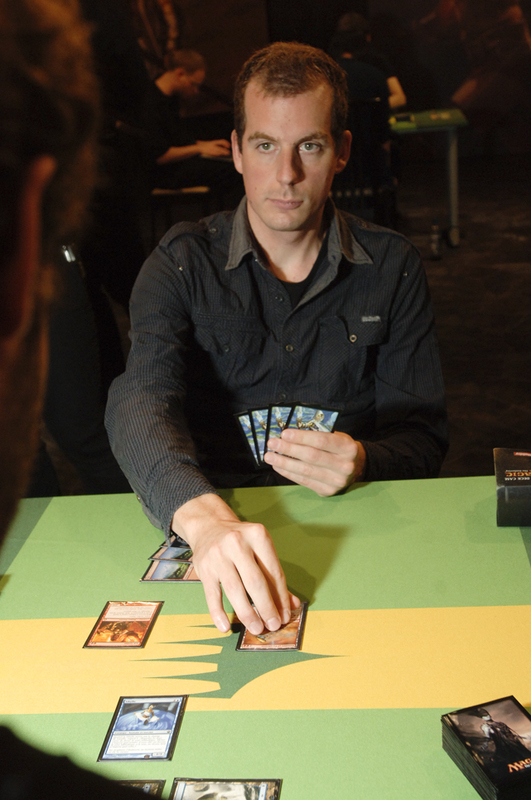 Frenchman Jeremy Dezani has four Grand Prix Top 8 finishes to his name, including a win at Grand Prix Lyon 2012. Dezani's Mono-Blue Devotion deck differs a bit from the one that made waves – in more ways than one – from Team StarCityGames, but nonetheless has the same expected suspects such as Thassa, God of the Sea and Master of Waves. Following France's win at the World Magic Cup, Dezani and his two countrymen are representing a new resurgence in professional French Magic. 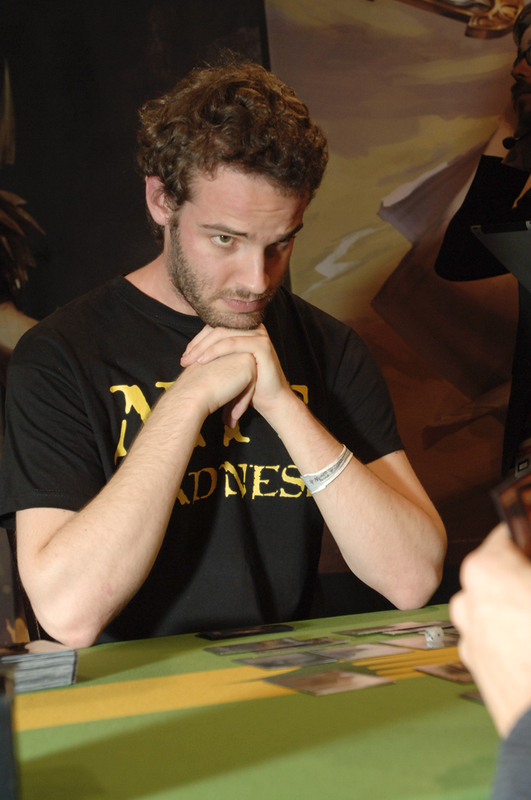 Kamiel Cornelissen, Hall of Famer and a master of the game, clashes with up-and-comer Frenchman Jeremy Dezani, who is adding a Pro Tour Top 8 to his resume which includes a Grand Prix win in 2012. With both players devoted to a single color, the two players will be clashing in a classic showdown between red and blue. Dezani was the player with the most action early on, opening with Judge's Familiar, Frostburn Weird, and Nightveil Specter with a solid early curve. Cornelissen, however, had little going on. And what little he had, Ash Zealot, became nothing when he attacked into Nightveil Specter with the intent on hitting the flier with Magma Jet before first strike damage. However, when he tried that play, Dezani sacrificed Judge's Familiar to counter the instant, leaving Cornelissen in an awkward spot when he played a land after that combat. "If I played a land before attacking, it would have been better," said Cornelissen. "But that was a game I could not win anyway." Cornelissen referred to his hand being sup par for the first game, and his lands were not allowing him to do anything significant. Sure enough, his hand provided little action, and Dezani quickly got online with Master of Waves. Then, to put a nail in the coffin, Dezani had a second copy of the mythic merfolk. "We're uh...looking for more tokens," table judge Kim Warren replied. Cornelissen quickly conceded when Disperse took care of his most expensive blocker. The second game went in similar fashion, with Cornelissen's deck not providing any big starts and stalling on three lands. The stall happened for one too many turns, as Dezani amassed a board of blue creatures for his Master of Waves, with a second one found via Jace, Architect of Thought to end the game. The third game presented a much closer race, with Ash Zealot leading things from Cornelissen. Omenspeaker acted as a blocker early on, but Cornelissen went above that with Boros Reckoner. Dezani cast Judge's Familiar with passed with two mana open, using that mana to Disperse the Reckoner on the next turn. Cornelissen attempts to come back from a rough first two games. Dezani continued to buy time, casting Jace, Architect of Thought and going to five loyalty. However, Cornelissen was hitting lands in the third game, allowing him to cast Burning-Tree Emissary into Stormbreath Dragon in an attempt to take out Jace. Dezani was forced to chump-block with Judge's Familiar to keep his Jace online, and Jace fell to one loyalty. However, Dezani had a solid road-block for Cornelissen's ground force with Master of Waves for four tokens. The Stormbreath Dragon was still a real threat, however, and the dragon promptly took out Jace on the next turn. Dezani, needing something to apply pressure, played the last cards out of his hand in the form of two Nightveil Specters. Cornelissen drew and finally played his key land with Nykthos, Shrine to Nyx. He used it to make his Stormbreath Dragon monstrous, and an attack that followed put Dezani down to 11. Dezani, in a bind, started attacking with his Nightveil Specters to race. He played Mutavault and passed. Cornelissen then sent in his 7/7 dragon and Boros Reckoner. Dezani thought about the proper block, then chose to wake up his new Mutavault, a 3/3 courtesy of Master of Waves, to block Boros Reckoner. "Damage?" said Cornelissen. Boros Reckoner sent damage to Dezani, dropping him to 1 between that and the dragon. Dezani was down, but he was not out of the game just yet. Dezani drew and sent in his Specters, dropping Cornelissen to 12. He played his freshly drawn Nightveil Specter and passed, and the new Specter immediately jumped in front of the incoming dragon. Cornelissen, however, only had the dragon as an attack and no other action. Dezani, meanwhile, found Thassa, God of the Sea waiting for him on top. He sent in a Specter and a Master of Waves token that he made unblockable with Thassa, dropping Cornelissen to 8 and leaving back a Specter to block. When Cornelissen found no burn waiting on top of his deck, the writing was on the wall. Dezani untapped, made four of his Master of Waves tokens unblockable, and attacked for 8 damage. Cornelissen offered the handshake to Dezani's lethal attack. Jeremy Dezani wins 3-0 and advances to the Semifinals!